Germany has taken the lead among European Union member states to back Washington’s regime-change agenda for Venezuela. Berlin’s hypocrisy and double-think is quite astounding. Only a few weeks ago, German politicians and media were up in arms protesting to the Trump administration for interfering in Berlin’s internal affairs. There were even outraged complaints that Washington was seeking “regime change” against Chancellor Angela Merkel’s government. Those protests were sparked when Richard Grenell, the US ambassador to Germany, warned German companies involved in the Nord Stream 2 gas pipeline with Russia that they could be hit with American economic sanctions if they go ahead with the Baltic seabed project. Earlier, Grenell provoked fury among Berlin’s political establishment when he openly gave his backing to opposition party Alternative for Germany. That led to consternation and denunciations of Washington’s perceived backing for regime change in Berlin. They were public calls for Grenell to be expelled over his apparent breach of diplomatic protocols. Now, however, Germany is shamelessly kowtowing to an even more outrageous American regime-change plot against Venezuela. Last week, the government of President Nicolas Maduro ordered the expulsion of German ambassador Daniel Kriener after he greeted the US-backed opposition figure Juan Guaido on a high-profile occasion. Guaido had just returned from a tour of Latin American countries during which he had openly called for the overthrow of the Maduro government. Arguably a legal case could be made for the arrest of Guaido by the Venezuelan authorities on charges of sedition. When Guaido returned to Venezuela on March 4 he was greeted at the airport by several foreign diplomats. Among the receiving dignitaries was Germany’s envoy Daniel Kriener. The opposition figure had declared himself “interim president” of Venezuela on January 23 and was immediately recognized by Washington and several European Union states. The EU has so far not issued an official endorsement of Guaido over incumbent President Maduro. Italy’s objection blocked the EU from adopting a unanimous position. Nevertheless, as the strongest economy in the 28-member bloc, Germany can be seen as de facto leader of the EU. Its position on Venezuela therefore gives virtual EU gravitas to the geopolitical maneuvering led by Washington towards the South American country. What’s more, the explicit backing of Juan Guaido by Germany’s envoy was carried out on the “express order” of Foreign Minister Heiko Maas, according to Deutsche Welle. “It was my express wish and request that Ambassador Kriener turn out with representatives of other European nations and Latin American ones to meet acting President Guaido at the airport,” said Maas. It’s staggering to comprehend the double-think involved here. Guaido was hardly known among the vast majority of Venezuelans until he catapulted on to the global stage by declaring himself “interim president”. That move was clearly executed in a concerted plan with the Trump White House. European governments and Western media have complacently adopted the White House line that Guaido is the legitimate leader while socialist President Maduro is a “usurper”. That is in spite of the fact that Maduro was re-elected last year in free and fair elections by a huge majority of votes. Guaido’s rightwing, pro-business party boycotted the elections. Yet he is anointed by Washington, Berlin and some 50 other states as the legitimate leader. Russia, China, Turkey, Cuba and most other members of the United Nations have refused to adopt Washington’s decree of recognizing Guaido. Those nations (comprising 75 per cent of the UN assembly) continue to recognize President Maduro as the sovereign authority. Indeed, Russia has been highly critical of Washington’s blatant interference for regime change in oil-rich Venezuela. Moscow has warned it will not tolerate US military intervention. Russia’s envoy to the UN Vasily Nebenzia, at a Security Council session last month, excoriated the US for its gross violation of international law with regard to Venezuela. Moscow’s diplomat also directed a sharp rebuke at other nations “complicit” in Washington’s aggression, saying that one day “you will be next” for similar American subversion in their own affairs. Germany’s hypocrisy and double-think is, to paraphrase that country’s national anthem, “über alles” (above all else). German politicians, diplomats and media were apoplectic in their anger at perceived interference by the US ambassador in Berlin’s internal affairs. Yet the German political establishment has no qualms whatsoever about ganging up – only weeks later – with Washington to subvert the politics and constitution of Venezuela. How can Germany be so utterly über servile to Washington and the latter’s brazen criminal aggression towards Venezuela? It seems obvious that Berlin is trying to ingratiate itself with the Trump administration. But what for? 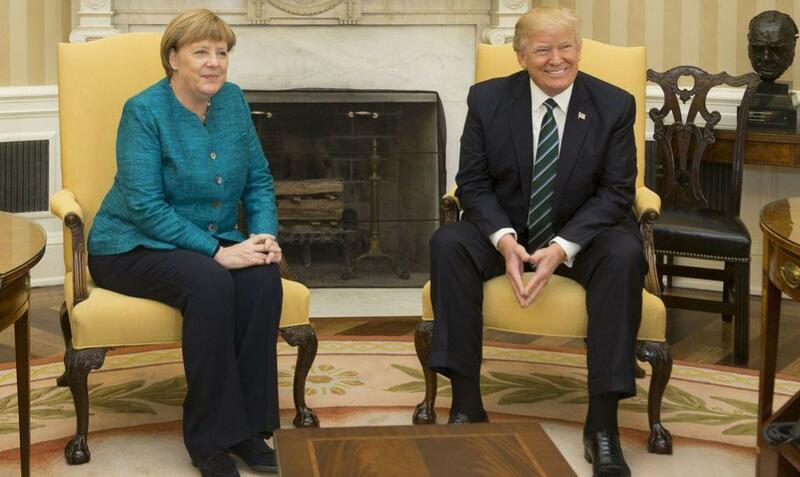 Trump has been pillorying Germany with allegations of “unfair trade” practices. In particular, Washington is recently stepping up its threats to slap punitive tariffs on German auto exports. Given that this is a key sector in the German export-driven economy, it may be gleaned that Berlin is keen to appease Trump. By backing his aggression towards Venezuela? Perhaps this policy of appeasement is also motivated by Berlin’s concern to spare the Nord Stream 2 project from American sanctions. When NS2 is completed later this year, it is reckoned to double the capacity of natural gas consumption by Germany from Russia. That will be crucial for Germany’s economic growth. Another factor is possible blackmail of Berlin by Washington. Recall the earth-shattering revelations made by American whistleblower Edward Snowden a few years back when he disclosed that US intelligence agencies were tapping the personal phone communications of Chancellor Merkel and other senior Berlin politicians. Recall, too, how the German state remarkably acquiesced over what should have been seen as a devastating infringement by Washington. The weird lack of action by Berlin over that huge violation of its sovereignty by the Americans makes one wonder if the US spies uncovered a treasure trove of blackmail material on German politicians. Berlin’s pathetic kowtowing to Washington’s interference in Venezuela begs an ulterior explanation. No self-respecting government could be so hypocritical and duplicitous. Whatever Berlin may calculate to gain from its unscrupulous bending over for Washington, one thing seems clear, as Russian envoy Nebenzia warned: “One day you are next” for American hegemonic shafting.